Recently, I came across a Greasemonkey script for Wikipedia. The script helps us to view Wikipedia articles in multiple columns. I found this to be useful and in fact saw that it improved my reading speed. In the last one week, I have referred to a lot of Wikipedia articles, and I am really addicted to this multi-column hack. And if I end up visiting this site frequently, then I can add a Greasemonkey script or a Userstyle for the page or set of pages. 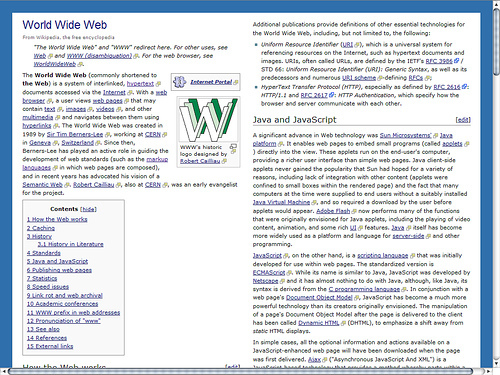 The above screenshot shows a Wikipedia page as displayed in my browser. So why is this so useful? Sometime back, when I was reading an article on usability, I learnt that the reading speed depends on the width of the column. This is one of the reasons why you are able to read news articles faster in newspapers than online. You end up spanning the page vertically rather than horizontal + vertical eye movements. Rather than point to a single article, I would like to point you to the Google search for the study around this topic. Some of the popular pages where I have added this multi-column functionality are: Wikipedia, Developerworks and Javadocs.